Total number of suicides: 458 compared to 431 in 2016. Suicide rate (per 100,000 population): 13.8 compared to 13.1 in 2016. Emergency department discharges due to self-inflicted injury: 3,098 in 2016 (most recent year available) compared to 3,248 in 2015—a drop of 5 percent. The percentage of crisis calls, as opposed to calls about other mental health issues, to the County’s Access and Crisis Line: 31.4 in 2017 vs. 25.7 in 2016. The line gets about 90,000 calls each year. Visits to It’s Up to Us, the County’s suicide prevention website: 265,771 in 2017 vs. 246,273 in 2016—an 8 percent increase. Number of students who seriously considered suicide: 14.5 percent in 2016 vs 17.5 in 2014 (data gathered every other year). People who participated in suicide prevention trainings conducted by the Suicide Prevention Council: 3,627 in 2017 vs. 1,937 in 2016—an 87 percent increase. The great majority of people who die by suicide show warning signs. Knowing how to spot them and what you can do may help save a life. “Helping people get help for a mental disorder is part of the County’s Live Well San Diego vision of healthy, safe and thriving residents,” Krelstein said. “When a friend or a loved one comes to you for help, take it seriously. Ask if he or she is having thoughts of suicide or ending it all. 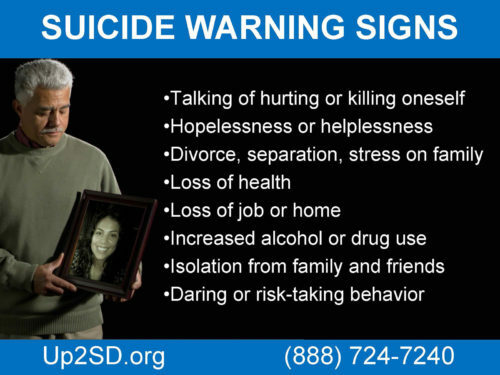 That simple conversation can help save a life.” To help curb suicide in San Diego, the County has several ongoing prevention efforts, including the It’s Up to Us campaign, the Mental Health First Aid and Question, Persuade and Refer trainings, and the Access and Crisis Line, a confidential counseling and referral hotline for people who feel overwhelmed or are experiencing a mental health crisis. “The good news is that fewer people are ending up in the emergency room because of a self-inflicted wound and more San Diegans are reaching out for help and calling the hotline,” Krelstein said. Suicide is preventable. That is why it is important to learn the warning signs, risk factors and behavioral cues of people considering ending their lives.